This CellML model runs in OpenCell and can reproduce one oscillation (which is true to the published results) but is unable to produce further oscillations. This is probably because there are time delays in the origianl model which as yet can not be described in CellML. The units have been checked and they are consistent with just small equivalencies in pico and nano grams per ml. The CellML model also runs in COR but the long duration of the simulation is not ideal for this tool. ValidateCellML verifies this model as valid CellML, although unit inconsistencies are detected. ABSTRACT: We produce here a model to explain the control of testosterone secretion. In this model the hypothalamic secretion of the hormone LHRH (luteinizing hormone releasing hormone) is controlled by a combination of local testosterone concentration and of the local concentration of the pituitary hormone LH (luteinizing hormone). 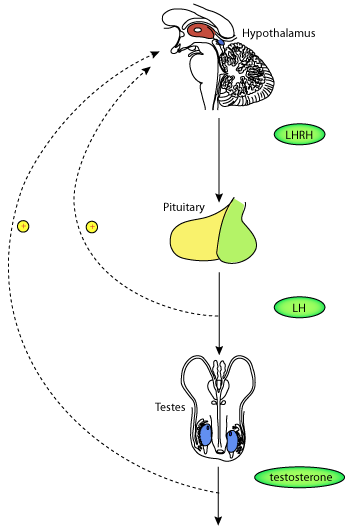 Since LHRH stimulates the release of LH, and LH in turn stimulates the release of testosterone, the three hormones constitute a three-component "feedback" network. We show how this model is able to account for the pulsatility of the release of these three hormones. Furthermore, the model is consistent with results obtained from a wide range of experimental manipulations of the system. For example, it accounts for the changes observed in hormone release patterns after castration. In particular, it follows that no "neural clock", or "neural pulse-generator", is required to force the system into pulsatile behaviour. Derived from workspace Cartwright, Husain, 1986 at changeset f21f3bbcd686.